North Koreans in exile are the only North Koreans who right now have any chance of having their voices heard; the May issue of the on-line magazine Words Without Borders lets us listen to seven of them. If North Koreans are to reclaim their language from their politicians, they must be able to distinguish truth from lies. Lee has selected pieces that all deal, in differing ways, with exiles’ struggles to understand that the dark fantasies the regime spun them at home were precisely that: fantasies, and not reality. Beneath this overarching theme, three concerns recur: drugs, maternal love, and hunger. Did you know North Korea has a large population of junkies? Or that the regime, as a (presumably?) unintended consequence of trying to raise foreign capital by selling drugs abroad, has encouraged large numbers of its own people into becoming pushers and users? If these are new ideas to you, as they were to me, then read the only fictional offering in the issue, After The Gunshot, by Lee Ji Myung, translated by Shirley Lee, which is about drug smugglers on the Sino-North Korean border, or A Blackened Land, a memoir by Kim Yeon-seul, translated by Sora Kim-Russell. This is an account of the devastating effects of crystal meth addiction. When the content is so distressingly compelling, it feels wrong to comment, even positively, on the style, but, through the veil of translation, this struck me as strong writing. Here Kim Yeon-seul describes her junkie husband lighting-up: “When he rolled (crystal meth) up in the shiny aluminum lining of a cigarette pack and touched the lighter to it, bluish gray smoke would curl up from it, like a cobra dancing to a flute.” Isn’t that an apt simile, beautifully ugly and sinister? Meanwhile, The Poet Who Asked For Forgiveness, by Gwak Moon-an, translated by Shirley Lee, is a factual account of how a poet is bullied, as a strategy for survival, into writing a hymn praising The Party as Mother - a superhuman mother to be revered over any mere biological mother. All North Koreans are now required to learn this hymn by heart; expressions of love between biological mothers and their children have become subversive acts. through the translation, publication, and promotion of contemporary international literature. Its publications and programs enable readers of English to explore the multiplicity of viewpoints, richness of experience, and differing perspectives on world events offered by writers in other languages. It provides a location for global literary conversation, principally through its monthly on-line magazine. This includes ten to fifteen pieces of fiction, poetry, and non-fiction not previously translated into English; to date the magazine has published over 1,600 pieces by writers from 119 countries, translated from 92 languages. Susan Harris is the editorial director of the on-line magazine. She spoke to me, via e-mail, from Chicago: WWB is virtual; it has no offices, Susan and her colleagues all work from home, either in the States, or in London. I wondered how much lead-time is required for each issue, and what happens if world events render commissioned material out-of-date? “We work well in advance on the issue themes, and we've already scheduled most of 2014, but we acquire work for the monthly features, usually three to four pieces, closer to publication. We try to remain flexible to accommodate breaking news and other developments. In 2011, I'd planned an issue of writing from the three languages of Algeria - Arabic, French, and Berber - for August. In January the uprisings started, and we realized that, regardless of what transpired over the next seven months, we would need to acknowledge the situation. Then all the dominoes started to fall, and it became clear that the entire region was undergoing revolution. So we took apart our schedule and scrambled to publish two issues of writing from the Arab Spring, in the rough order of the uprisings: July with North Africa (Algeria, Egypt, Libya, Sudan, and Tunisia), and August with the Middle East (Bahrain, Jordan, Saudi Arabia, Syria, and Yemen). Words Without Borders is at http://wordswithoutborders.org/. They are interested in expanding their offerings from Asia, particularly in the languages they haven't yet published – Thai, Khmer and Laotian. So if you are in Thailand, Cambodia, or Laos, get writing! My next post will be on Words Without Borders’ North Korean issue. Have you read it yet? If so do please share in advance your opinions. 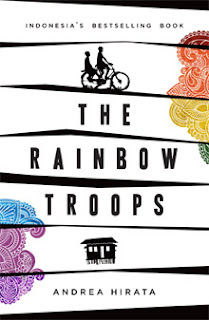 If you’re fed up with books about lucky westerners going through a patch of angst, then read The Rainbow Troops by Andrea Hirata, which was originally published in Indonesian. It is now available in English translated by Angie Kilbane; I read the Australian edition from Random House. The Rainbow Troops are a group of dirt-poor students from the ramshackle Muhammadiyah Elementary School on the Indonesian Island of Belitong. Have you heard of Muhammadiyah? I hadn’t, until I read The Rainbow Troops, but I now know it’s a charity that helps Muslims via education – the novel employs all sorts of Malay and Muslim words and concepts previously unknown to me. The Rainbow Troops get their name from sitting in a tree in their schoolyard looking for rainbows. In Indonesian they are called Laskar Pelangi. Either the author, or the translator, explains that pelangi means rainbow, and laskar means warriors, but I suppose the novel couldn’t be called, in English, The Rainbow Warriors, because of associations with Greenpeace? Mind you, The Rainbow Troops fight hard for their environment, and this novel might prod you to do a light spot of internet research on tin mining in Indonesia. Tin mining is the backbone of the Belitong economy, and one of myriad threats to the existence of The Muhammadiyah School comes from a rapacious mining company which wants to knock it down to dredge the land it stands on. The Rainbow Troops see off this threat, as they see off many others. This is not, however, a feel good novel with happy endings all round. The narrator, Ikal, is a clever boy, but not the cleverest in his class; he perpetually comes second to Lintang, a genius who is so desperate for an education that he daily crosses crocodile infested swamps to get to school. Lintang’s fate will make your blood boil, as will this whole novel, it is a book furious at the injustice of the world, but it wears its anger lightly, and it charms, rather than lectures – it deceives you into thinking. There is only one girl in Ikal’s year, a gender imbalance he appears not to notice, although I’m sure all western readers will ponder it. The novel does, however, have a courageous, inspiring female character, Bu Mus, one of the two extraordinary teachers who provide The Rainbow Troops with hope for the future. Bu Mus is only fifteen when she starts teaching, she is not qualified in any way that would be recognised in the West, she receives no pay for her work – and she is a heroine adamant the children in her care will be freed by education from the illiteracy and drudgery which blight their parents’ lives. I urge you to read The Rainbow Troops. Unless you share Ikal’s background, it will force you to think about lives very different from your own, and unless you are impoverished by Asian standards, it will force you to consider how privileged you are. But this is not a self-consciously worthy or earnest book, it is instead gentle: warm, tender, and heartbreaking. 500 Words From is a series of guest posts from writers and translators. Bangkok-based Stephen Leather is a highly successful thriller writer. His self-published eBook The Basement was Number 1 in the Amazon Kindle charts in the US and the UK. He here draws on his experience to offer encouragement to others around the region who think they could do better than published authors, and who want to have a go at self-publishing. A debut author wouldn’t be able to send his or her manuscript to fans, and might not be able to afford an editor in New York, but the process Stephen outlines – editing, design, formatting, eMarketing – would be the same for a newcomer to self-publishing, as it is for him. A self-published author pays the costs of publishing. It is probably best not to try to save money on editing - you need the best editor you can afford - but you can bring the design costs down, whilst still getting a great cover, by posting your job on internet auction sites. So: 500 words from Stephen Leather for Asian Books Blog. It’s never been easier to be a writer based in Asia, and it’s all thanks to the internet. I can sit in my apartment in Bangkok and send my newly-completed book to half a dozen readers and fans in the US and the UK to check that it works. Once I’ve incorporated their suggestions, I can send it to an editor in New York who polishes it and then sends it back to me. I have cover designers around the world – in the UK, the US and India – and depending on the type of book I commission the artist who I think will do the best job. I usually get the completed cover back within a couple of days. Then I send the edited book to a lovely lady in France who formats it for me so that it can be uploaded to Amazon – to publish on the Kindle – and to Smashwords, who sell it everywhere else. Once the formatted file comes back to me – usually within hours – I can download it to the Kindle servers in Seattle and the Smashwords servers in California. The book will go on sale within twenty-four hours and two months after that any money earned is paid into my bank account. And over the next few weeks, readers who have spotted typos and mistakes in the finished product will let me know and I’ll fix them, within hours. And the amazing thing about the entire process is that I have never met any of the people involved. In fact I’ve never even spoken to them – all communication has been by email. It’s a far cry from the state of publishing when I wrote my first novel some twenty-five years ago. Back then I wrote on a manual typewriter, and my first editor at Collins worked on the manuscript with a pencil. It was then given to a typesetter who retyped the entire manuscript, which was then checked by a proofreader before the book was printed. For that book, and many of my subsequent thirty-odd novels, I would sit down next to the editor and go through the manuscript page by page. If a typo did manage to get through, changing it was a time-consuming – and expensive – process. The advent of ePublishing has also changed the way that writers relate to the readers, and vice versa. In the old days – actually only five years ago – it made sense for a writer to go on lengthy book tours, visiting book shops and libraries and signing books for readers. But these days it’s Facebook and Twitter where readers can be found. Instead of standing in a bookshop and talking to a dozen readers, I can post on Facebook and talk to thousands. And instead of readers posting a letter to me care of my publisher and getting a reply several months later, now they can tweet to me and get an answer within hours, no matter where in the world I am.